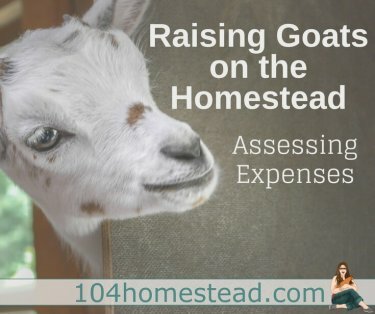 So you’ve been dreaming of goats and calculating the expenses. It’s finally time to get prepared for your first goat. Today I am so excited to have my friend Lesa Wilke of Better Hens & Gardens visiting to answer my many goat-raising questions. Ever since the decision to get Nigerian Dwarf goats for our homestead, she has put up with my numerous goat inquiries. 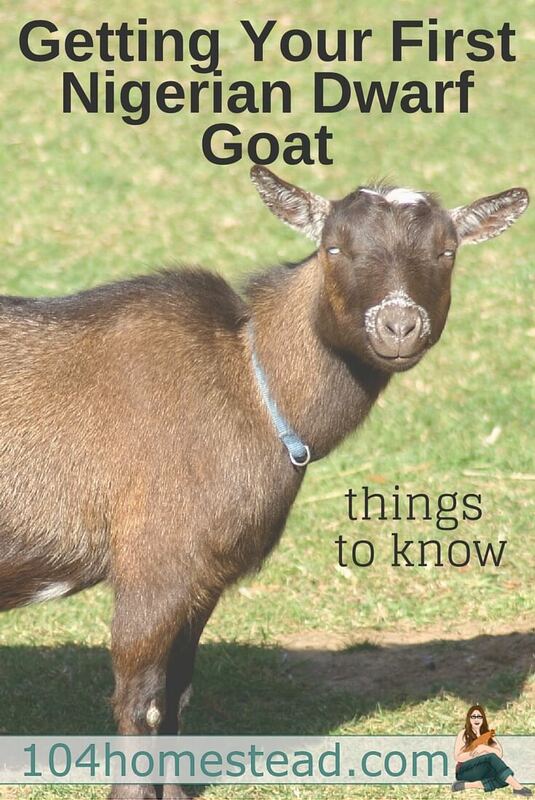 When she published her book, Nigerian Dwarf Goats 101: Background & Basics, she offered to send me a copy. I read it from digital cover to cover. It answered many of my questions and taught me quite a few things I didn’t even know I didn’t know. I figured other people who are considering goats probably have similar questions as I did, so Lesa was kind enough to share her answers with us all. If someone was just starting a small dairy herd and wanted to get two goats, what ages would you recommend? It’s important to know that goats are herd creatures, so they need a companion or they become very unhappy. I won’t sell a single animal unless they are going to a home where there are already companion goats or other animals. So, the first thing to realize is that you will need some combination of at least two, unless the goat is intended as a companion to another species (such as horse, lama, etc.). For those wanting the incredible milk produced by Nigerian Dwarves, then purchasing two good quality doelings (young does) might make sense. By bringing them home just after weaning or as bottle babies, you can insure that they are well socialized as they grow, and you will have time to learn to care for them before needing to learn about breeding, kidding, and milking. However, many of the quality doelings from great milking lines are reserved months before they are born, so it’s a good idea to get on a reservation list early. The downside of this approach is that you will have to wait at least a year and maybe two before getting that terrific milk. For those wanting the milk immediately, one approach is to purchase a doe in milk and her doeling. This gives you the benefit of immediate milk without having to deal with breeding and kidding right away. You will have to learn how to milk and care for the mature doe, but you also get milk and the benefits that go along with raising your own doeling. Finding a doe and doeling for sale from great milking lines can be difficult, so this is an strategy that sometimes takes time to execute. Two does already in milk also works if you’re ready to jump into milking, but it’s a good idea to milk any mature goats and taste their milk to make sure you’re ready before bringing them home. How important is pedigree? Does it really help when selling kids? Again, it depends – if you’re buying wethers that will be pets, then a pedigree doesn’t matter much. 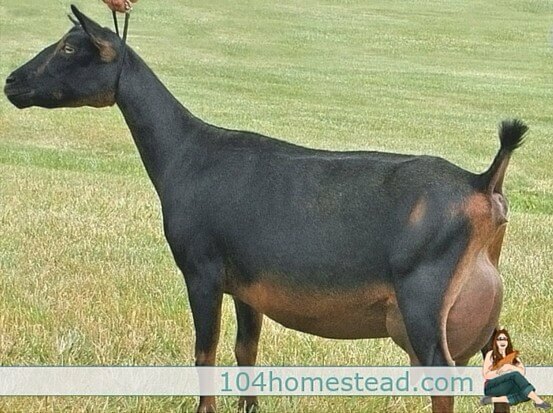 However, if you’re buying goats for milking or showing, then pedigrees become highly important. Particularly for those new to goats (and even for those that have been breeding them), it’s very difficult to tell how much milk a doeling is going to produce or how conformationally correct a goat will become. By examining the pedigree, it’s possible to “predict” how conformationally correct a goat will be and how much milk she might produce. When selling kids, buyers also want to see pedigrees so they have an idea that they’re buying a goat that will achieve their goals. There is a lot of talk about grain requirements. How much do I give each day/twice a day? Again, this depends a great deal on their age, gender, and what kind of grain you’re feeding them. It’s important to watch their body condition and adjust the amount of grain they’re receiving based on their weight and condition. Mature bucks are generally not supposed to require a grain supplement; however, we’ve found that they do need a grain supplement formulated for them during the main breeding (fall) season. And the closer they’re housed to the girls, the more grain they seem to need. We have fed up to two cups twice a day to mature bucks. Does that are dry or that are in their first couple of months of pregnancy also shouldn’t need a grain supplement. We start feeding pregnant does a small grain supplement a couple of weeks before they freshen, and then increase to a much larger grain supplement once they’ve freshened and are producing milk daily. You don’t want to start them on grain too soon before they freshen or the babies will get big and may be difficult to deliver. During full milk production, a couple of cups of grain supplement twice daily might be considered typical for a mature doe. There are all sorts of “blocks” at the feed store in the goat section. Do I need all those blocks? 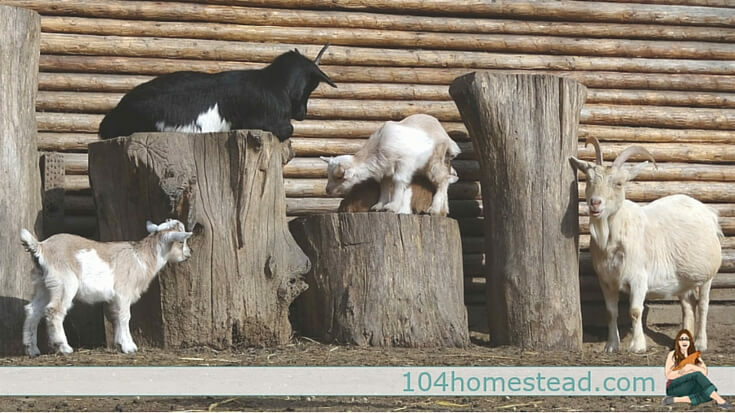 What kind do my goats need? Those blocks are mineral blocks, and in most areas of the country, goats need supplemental minerals. For Nigerian Dwarf goats, we recommend feeding “free choice” loose goat mineral (not a block) and baking soda. They will eat the mineral and baking soda as needed. How much hay does a Nigerian Dwarf goat eat in a week? That depends, both on the age and gender of the goat, and the kind and quality of hay. It’s a little hard to generalize because hay and goats vary so much, so I’ve tried to use quantities that are on the high side below so there aren’t too many surprises on how much they eat. Male goats (bucks) don’t really need a high quality legume hay (such as alfalfa). They generally need only a first cutting alfalfa that contains lots of grass hay. An adult buck getting grass or first cutting alfalfa hay will eat a couple of flakes a day. There are usually about 14 flakes of hay in a standard square bale. So, for a mature buck, perhaps a bale a week. For an adult doe, it depends on whether she’s dry (not in milk), lactating, or pregnant. An adult doe that’s dry also doesn’t need a high quality legume hay. She might eat about a flake a day of grass or first cutting alfalfa hay. A standard square bale might last her two weeks. Does that are pregnant don’t need a high quality legume hay until shortly before they’re ready to freshen (give birth). Since they’re eating for more than just themselves, they will ramp up from a flake to two (or more) flakes a day. Starting shortly before they freshen, then it’s important to provide them with a high quality legume hay. This will help them with the ability to produce milk. The amount they eat will depend on how many kids they’re feeding and the quality of the hay. A couple of flakes daily of very good quality alfalfa (second or third cutting) are typical. Are there different kinds of hay? Yes, there are grass hays (such as timothy) and there are legume hays (such as alfalfa). Legume hays provide much higher protein levels than grass hays, and are beneficial for does that are producing milk. Dry does, bucks, and wethers generally don’t need legume hays. Within the legume hays, it’s often possible to choose from 1st, 2nd, or 3rd cuttings. Protein levels generally increase with the age of cutting. The highest quality (2nd or 3rd cutting) alfalfa hays should typically be reserved for does that have just freshened and are producing milk. Can I grow legumes for my goat’s dietary needs? Can I plant things in the goat yard for them to eat? Of course! Just remember that they can quickly eat a small shrub. Make sure that you don’t plant anything that is poisonous. You can also grow fodder for them to save money. I want my goats to clear land for me? How do I find out if there are plants in there that are bad for them? It’s important to find out which plants grow in your area that are poisonous to goats. Learn to identify them and search through their pasture area and eliminate them. Cornell University has a list online that you can use as reference: http://poisonousplants.ansci.cornell.edu/goatlist.html Well meaning neighbors have also been known to poison them by providing cuttings from common landscape shrubs (such as rhododendron). Are there things I can do (entertainment stuff) to encourage my goat to not escape? Adding large rocks or structures to their pasture for them to play on as “toys” encourages them to stay inside. Just make sure the structures aren’t so close to the fencing that it helps them escape. Enrichment is important for all livestock. Can I take my goat for a walk? Is it hard to leash train them? Will a Nigerian Dwarf goat outmaneuver my 10 year old while on a leash? 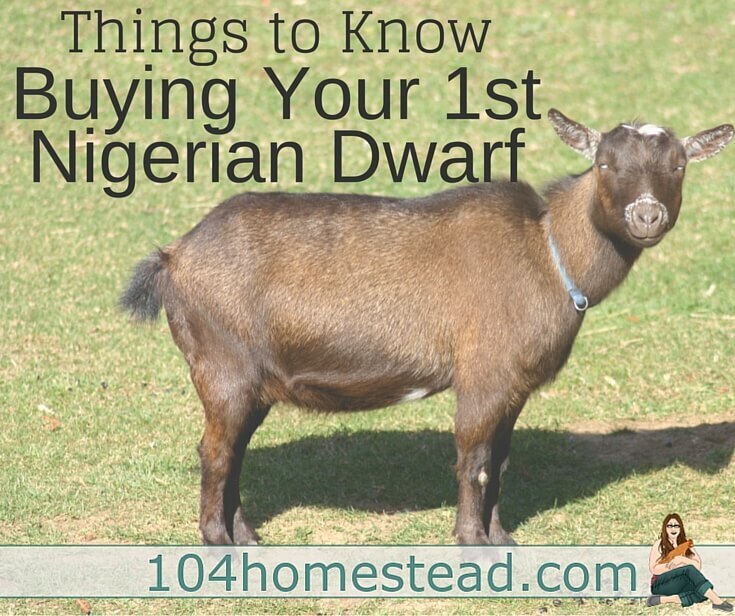 Nigerian Dwarf goats are really quite bright, and can pick up on a schedule or training quickly. You can start training them to walk on a leash when they’re small. Once trained they should be easy to handle, even for a 10 year old. It can be difficult to train an older doe that isn’t used to a leash. They enjoy being given “treats” as a reward when they do things correctly – we use animal crackers which they love. 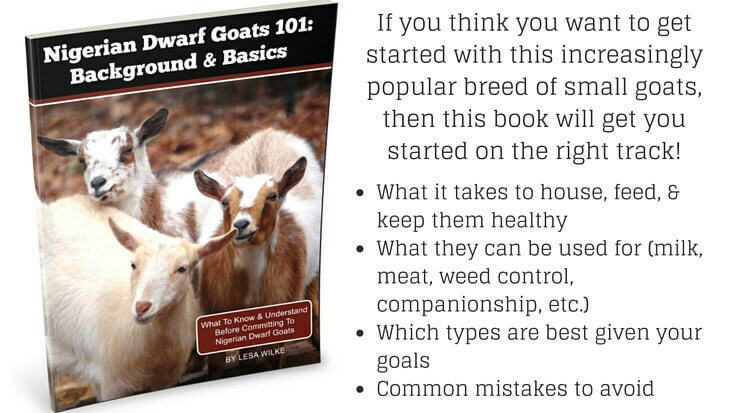 In Nigerian Dwarf Goats 101: Background & Basics, Lesa covers several of these topics as well as more in-depth information on the breed. If these backyard goats are on your wish list, I highly suggest checking out her site (she has a great goat section) and buying the book. For just $4.99, it’s a great investment. You can get your copy here. We recently rescued a small goat, that we thought was a baby just to find out that she has adult size teets, but no milk, and appears to be a precious nigerian dwarf. She had a large belly, but that has trimmed down some and does not look as bloated. She is pooping. No large utters etc. tiny sharp horns on her. I split a bail of hay in our chicken tractor one for bedding and the other for eating. The tractor is half covered and half fenced to keep her safe. Also gave her a salt lick and some sweet grain twice daily, and fresh water daily. I turn her loose every morning in our 1/2 acre fenced in back yard. with 15 chickens and an 18 pound dog. They appear to be getting along really well. She has only been her 3 days. She does like to follow us around and calls us when we go in the house.We tried to find the owner, but no one is claiming her. She almost got hit by a van. Now, my question are Is there a way to guess approximate age? She is about knee high. Also I use diatomaceous earth (food grade) to dust the chicken coops and run, for parasites. Will that bother a goat? This information was very general and unspecific. I found it to be very unhelpful. I’m sorry you didn’t find the article helpful. Feel free to check out our goat section for more detailed information. This was merely a general overview for people considering goats. Thank you so much for this post. I do have a question on hay. Would timothy, clover and alfalfa mix bales be acceptable for goats? Along with what they forage.